Local Correspondents, an independent music community, is hosting the 3rd Annual LC Fest May 13 – 19, 2009 at Bar4 in Park Slope, Brooklyn. The festival will include short sets from over 60 singer/songwriters and bands located in Brooklyn and New York City. This year the festival also coincides with the 4th anniversary of Local Correspondents. All performances are free to attend. Local Correspondents is a supportive community for independent artists based in Brooklyn. Weekly showcase series and open mic nights have brought together an extremely talented and diverse group of performers over the last four years. LC offers a helping hand to artists that have just moved to the NYC area with advice, tips, and opportunities to play. Local Correspondents was founded by Tanya Buziak, Larry Hyland, Greg Tuohey, and Jessi Robertson in April of 2005. It started as a monthly showcase at Bar4, then grew to include weekly showcases at Bar4 and Matchless, and monthly showcases at Rockwood Music Hall. In addition to the founding members, the LC Team also includes members Niko Kaparos, Paul Basile, Peter Pockets, and Kevin Johnston. In the spring of 2007, the first LC Music Fest was held at Bar4 and included four nights of music with more than 50 local acts performing. In 2008 the second LC Music Fest was expanded to five nights and included over 60 performers. 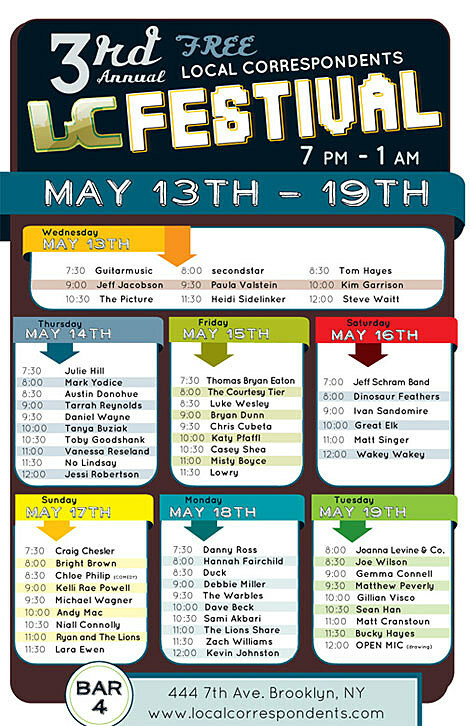 This year the LC Fest will span a full week, culminating in an open mic at midnight on Tuesday May 19. 8	Joanna Levine & Co.
Bar4 is located at 444 7th Ave. Brooklyn, NY 11215 on the corner of 15th St. and 7th Ave. Take the F train to 7th Ave. or Prospect Park/15th St. The venue phone number is (718) 832 – 9800.